1872 ലെ അന്നത്തെ മദ്രാസ് ഗവർണർ 'ഫയർ ധ്വര' തിരുവിതാംകൂർ സന്ദർശനം നടത്തി. മാൾട്ട് എന്ന ധ്വരയായിരുന്നു. ഗവർണറുടെ പൊളിറ്റിക്കൽ സെക്രട്ടറി. തിരുവിതാംകൂർ ദിവാൻജി സർ ടി. മാധവറാവു ആയിരുന്നു. മദ്രാസിൽ നിന്നും ഗവർണർ തിരുവിതാംകൂർ സന്ദർശിച്ചപോൾ പോളിറ്റിക്കൽ സെക്രട്ടറി ദിവാൻജി മാധവറാവുവിനോട് ഒരാവശ്യം ഉന്നയിച്ചു. 'കല്ലടയാറിനു കുറുകെ ഒരു പാലം പണിയുക'. ദിവാൻജി തൽക്കാലം അതിനു മറുപടി ഒന്നും പറഞ്ഞില്ല. കാരണം വർക്കല തുരപ്പിനുവേണ്ടി ഭീമമായ സംഖ്യ ചിലവു ചെയ്തു കഴിഞ്ഞിരുന്നു . തൻ നിമിത്തം ഖജനാവിൽ പണം തീരെ കുറവായിരുന്നു. ആ സമയം ദിവാൻജിയോടും ഗവർണറോടും ഒപ്പം മഹാരാജാവും ഉണ്ടായിരുന്നു. അപ്പോൾ മഹാരാജാവിന് ഒരു സംശയം ഉണ്ടായി. ആറിനു കുറുകെ പാലം പണിഞ്ഞു തീർന്നാൽ വന്യ മൃഗങ്ങൾ കടന്നു വന്ന് നിർദോഷികളായ തൻറെ പ്രജകളെ ഉപദ്രവിക്കുകയില്ലേ ? യദാർത്ഥത്തിൽ ഖജനാവിൽ പണം കുറവായിരുന്നു എന്നതാണ് അദ്ദേഹം അത് പറയാൻ കാരണം. പുനലൂർ തൂക്കുപാലം എന്തുകൊണ്ടും ആവശ്യമാണെന്ന് കാര്യകാരണം സഹിതം പൊളിറ്റിക്കൽ സെക്രട്ടറി രാജാവിനെ പറഞ്ഞു മനസ്സിലാക്കി. രാജാവ് മൗനസമ്മതം നൽകി. അധികം താമസിയാതെ മാർട്ട് പുനലൂരിലെത്തി പാലത്തിൻറെ പണിയെ പറ്റി ആലോചന തുടങ്ങി. അന്നത്തെ പൊതു ചീഫ് എഞ്ചിനീയറായിരുന്നു ബാർട്ടൻ ധ്വര (അദ്ദേഹത്തിൻറെ പേര് ആൽബർട്ട് ഹെൻട്രി എന്നും ചില രേഖകളിൽ കാണുന്നു. സ്കോട്ട് ലന്റുകാരനുമായിരുന്നു. ) പ്രശ്നം പരിഹരിക്കാൻ തീരുമാനിച്ചു. സോവിയറ്റ് റഷ്യയിലെ സെന്റ്‌ പീറ്റേഴ്സ് ബർഗ്ഗിലുള്ള ഗൾഫിനു മുകളിലൂടെയും, സ്കോട്ട് ലന്റിലുള്ള നദിക്കു മുകളിലൂടെയും തൂക്കു പാലം പണിഞ്ഞിട്ടുണ്ടെന്നും അതുപോലെ ഇവിടെയും പണിയാൻ കഴിയുമെന്ന് അദ്ദേഹം അഭിപ്രായപെട്ടു. ലോകത്തിലെ തൂക്കുപാലങ്ങളിൽ രണ്ടാം സ്ഥാനം പുനലൂർ തൂക്കുപാലത്തിനാണ്. 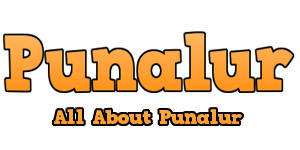 പുനലൂർ പേപ്പർമില്ലും പുനലൂർ തൂക്കുപാലവും ചരിത്രത്തിൻറെ തങ്കലിപികളിൽ എഴുതി ചെർക്കപ്പെട്ടിരിക്കുന്നു. അനാഥമായ തൂക്കുപാലവും ഓർമ്മകളുടെ ശവപ്പറമ്പിലേക്കു പറന്നകലുന്നു. എന്നിട്ടും അധികാരികൾ നോക്കി നിൽക്കുന്നു. ഇവർക്കു ചരിത്രം മാപ്പു നൽകുമോ ? Sir. Thanjavur Madhava Rao came to Travancore at a very critical juncture in its history: the State itself was threatened with annexation to the British Government. He handled this crisis with admirable courage and administrative acumen. India, being under British rule, the ‘native’ states had to perforce accept the resident as their overall head. 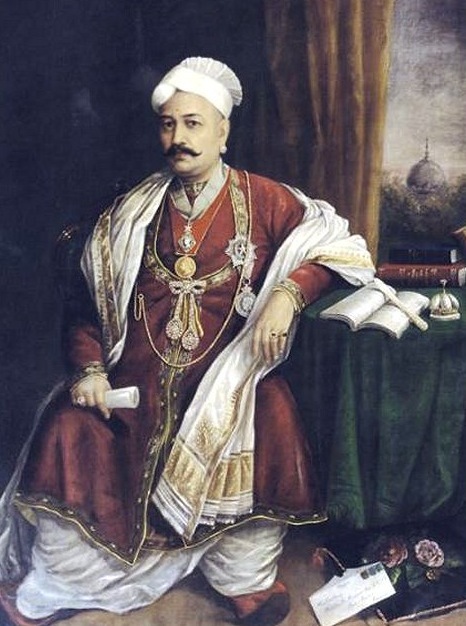 Beginning his service to the Travancore state as tutor, Madhava Rao rose to become the Dewan of the state by sheer dint of merit and the acumen he displayed in raising standards of administration of the state. Travancore emerged as a model state in the country for the innovative, modern and forward-looking policies that were introduced from time to time. The architect of a well-structured state administrative framework, adoption of progressive reforms and welfare measures, are the hallmark of Travancore in the period under the dewanship of Sir. Thanjavur Madhava Rao. 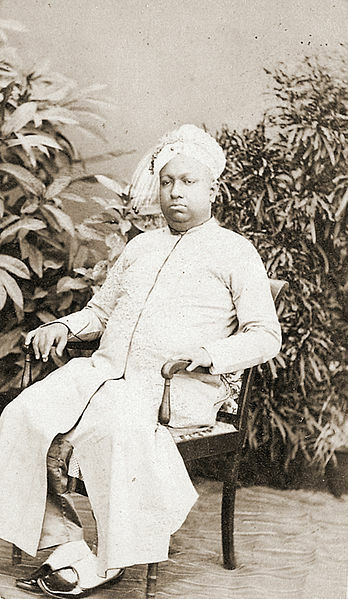 It would be worthwhile to remember that the first trip by the ruler of Travancore to the Madras (Chennai) Presidency was possible due to the balance that Sir. Thanjavur Madhava Rao struck in putting the relationship between the Native princely state and the British residency on even keel. Travancore as a state has many firsts to its credit – it touched education, health, public works department, civic amenities, postal service, women’s education, criminal justice system, fiscal and agricultural reforms, district administration – name it. Madhava Rao had taken a positive decision on it ! Many proclamations and ‘firmans’ (notices) were issued by Sir. Thanjavur Madhava Rao during his tenure for the abolition of duty on tobacco, pepper and rubber. Madhava Rao took over an administration that could at best be described as ineffective. it was at a time when the British threatened to take over the administration that Madhava Rao was given the responsibility of conducting the affairs of the state and postponing British control of Travancore. 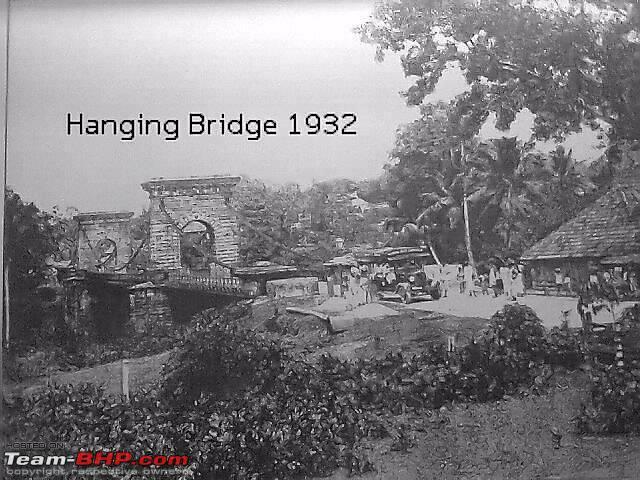 The Hanging Bridge of Punalur,Kerala, the only vehicular hanging bridge of Kerala and the second one in India built by the British. This old hanging bridge is now under the authority of archeology department, and is under maintainance. The construction and engineering of this hanging bridge marvel dates back to 1877, by a British engineer named Albert Henry. 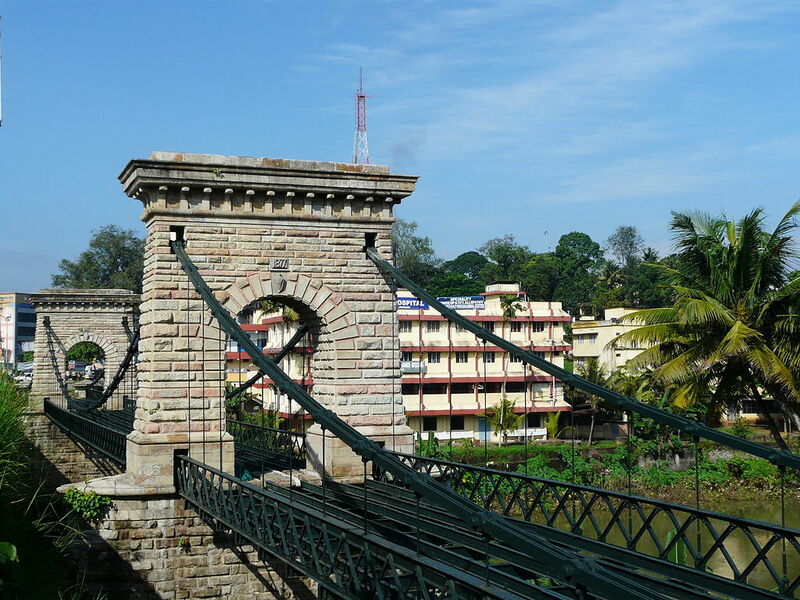 The bridge is situated across river Kallada and joins the Kollam -Chengotta state highway which is now NH 208, starting from Kollam and ending at Thirumangalaom in Tamilnadu. 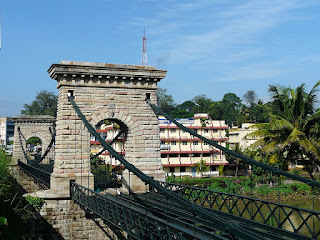 This snap is taken from one of the entrance of the hanging bridge. This ancient hanging bridge of Kerala is built of linked bar chains which are bolted with huge nuts and steel rod hangers which joins the chains with the deck. Two pillars supports the chains which inturn supports the deck. The chains runs through the top part of the pillars and the deck is laid through the pillars and supported at both ends of the bridge . The bridge is said to be a non-cement construction. I cant give you the exact mixture which replaced cement in this hanging bridge Grandpa. May be the ancient cosnstruction mixture of eggyolk, jaggery, lime etc which is used in the construction of River-dams like Mullaperiyar and ancient Palaces of Kerala. However the bridge still stands tall without any major fitness issues. When this bridge is finished people were afraid to use it seeing its hanging nature. The engineer Albert Henry passed in a country boat through the river under with his family while six elephants were made to walk through the bridge. May be the first and last bridge engineer who proved his bridge's strength like that huh! Inside view of one of the Four wells seen on both sides of the hanging bridge. The two ends of the twin steel bar chains which supports the bridge are anchored into these wells. The chains are made to pass through the pillar tops, basements on bridge entrances and finally fixed deep inside these wells. It seems like the Wells are interconnected too but am not sure about it. In olden times the wooden planks used in the bridge deck is from some peculiar tree in the forest named Kambakom. It is known to last for much time and is strong. But later in the renovation process of this hanging bridge much corruption was done by the lovely officials and replaced the old worn platform planks with some cheap type of timber and it doesn't lasted much time after the luxurious renovation CORRUPTION. 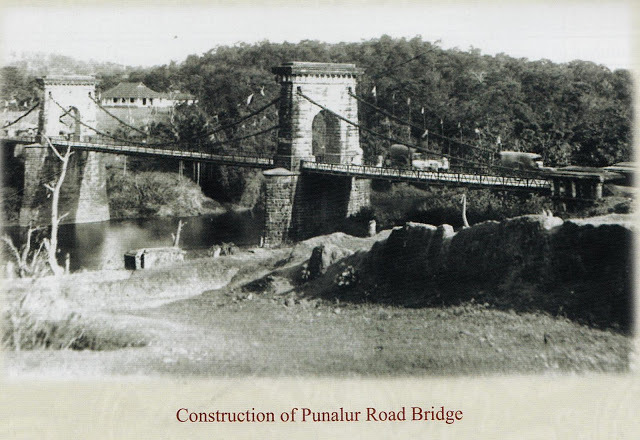 The works are started again to beautify the bridge and surroundings and hope this time things will be done right. The steel bars are being painted and wooden planks are to be fitted onto the steel deck structure of the bridge as before. Anyway there is no more vehicles to be allowed through for another parallel bridge is already built for transportation long before while the road was expanded. Now the authorities are trying to keep the bridge as a monument with archaeological importance. A small garden and resting place is going to be built around the bridge and in mean time it could be a resting and refreshing spot for the public and tourists around.